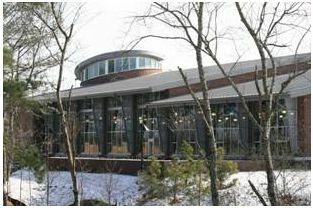 Libraries typically involve a wide variety of functions and consist of the main desk, large reading, and small study rooms, book stack areas, working and office areas, as well as rare volume vaults. Some will also include conference rooms, multimedia visual and listening rooms, computer rooms, exhibit areas, and possibly even an auditorium. Museums are often theme-related: art, natural and social history, scientific, maritime, space and other specialized themes. They include the entrance and exhibit areas, working and office areas, and artifact storage areas and vaults. Some exhibits are exposed for public viewing and others may be enclosed in cases or special rooms, or warehoused for a future exhibit. These structures often have specialized environmental needs to protect valuable and delicate contents that include old books, manuscripts, fabrics, stuffed and scientific exhibits, fossils, films, and tapes. Ambient conditions of both temperature and humidity must be closely controlled to prescribed standards 24 hours a day year-round. These conditions may also differ markedly from human comfort requirements. Therefore, individual room or area zone control is usually necessary, and separate systems are sometimes selected. Work areas where paints, restorative chemicals, plaster of Paris and other specialized materials may need special temperature, humidity and air circulating conditions are also needed. Some areas may have odors and vapor releases that require extensive ventilation. Specialized topic and industrial museums usually have less complex requirements. Since HVAC systems run year-round and cooling systems can easily run up to 5,000 hours a year or more, heavy-duty long-life equipment requiring minimum maintenance operation should be selected. All equipment should be carefully vibration and sound isolated to assure quiet comfort for both the staff and visitors. Sound level should be low, but not so low as to make normal ambient noises objectionable. Locate mechanical rooms as remotely as possible from reading and exhibit areas to minimize the cost of acoustic and vibration isolation. Radiant effects must be considered as well, and therefore the possibility of cold or hot walls and windows along with hot steam or water pipes should be avoided. If the collection is subject to radiant effects, the object conditions could be destructive even if the ambient conditions are under control. Since solar loads, occupancy, and lighting can vary widely in any given area, part load operation must be carefully considered. Some areas can experience people loads as high as 10 sq ft per person, while office spaces are usually in the 100 to 120 sq ft per person. Book stack areas can range up to 1,000 sq ft per person. Typical design conditions are for the relative humidity to be held below 55% with the room temperature in the 68 to 72°F range. Archive areas hold relative humidity at 35% with 85% or better filtration and room temperatures of 55 to 65°F in the stacks. Even the reading rooms are cooled to 68°F! Tapes should be kept no lower than 35% and, when the room temperature exceeds 65°F, no higher than 65% relative humidity. Always consult with the appropriate museum authorities for the optimal design conditions for specific collections. Maintaining the relative humidity is very important, particularly for hygroscopic materials, such as paper, wood, fabrics, and leather. Their moisture content comes into equilibrium with that of the ambient air. Studies have shown that if objects are permitted to cool down overnight, the next day they will be surrounded by layers of air having progressively higher relative humidities. These can rise to as high as 97% next to the object and can be very destructive. Likewise, if the object is warmed (by spotlights for example), they can be excessively dried out -- also very destructive. All-air systems are most often selected since any leaks in steam or water pipes could ruin books and other artifacts. Main reading rooms, large entrance halls, and galleries may have high ceilings that will permit air stratification designs. The most important criteria for air distributions are to avoid stagnant spaces in all exhibits or stack areas. Museum air distribution and lighting systems must also be very flexible to allow for changing partitions as exhibits change. 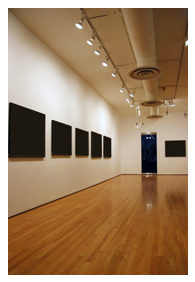 Where exhibit partitions create local "zone" pockets, transfer grilles in the partitions should be used. Smoking is usually not permitted in museums and libraries, but adequate ventilation is a must in any area so designated. The return air should flow through activated charcoal filters or all be exhausted. Removing airborne chemical pollutants and dirt is also important to preservation quality. However, electrostatic filtration is not recommended since it can produce harmful ozone. Some designs include special filters to remove sulfur dioxide. Where central plant designs are in use, incorporate heat recovery, thermal storage, and other energy conservation opportunities such as variable speed drive water pumps, and temperature reset on chilled and hot water distribution circuits. These complexes are also excellent opportunities for a central control system for fire, smoke and security, maintenance control and operations, and energy management. Older inefficient systems should be investigated for upgrading or replacement, particularly if CFC refrigerants are used. Replace antiquated or inappropriate control systems. Water heating is not a major energy user with uses typically for hand washing and cleaning purposes. Most water heating is done separately from the building heating system using direct resistance or gas heaters, and in some cases, point-of-use heaters. If existing systems are inefficient or inadequate, replace with modern efficient equipment. If a source of waste heat (i.e. tower water) is available, consider a water-to-water heat pump heater. Libraries range from small and simple in elementary schools to complex technical libraries on university campuses. Most have open reading or study areas and stack areas for storing books. They may also have a circulation desk, card or computer catalog area, conference and seminar rooms, display areas, and microfiche reading areas. Reading and reference areas need uniform horizontal illumination between 30 and 75 footcandles. Color temperatures of 3500 to 4100K and CRIs of at least 70 will create a natural atmosphere. Fluorescent fixtures with triphosphor lamps are a good choice. Table lamps may be appropriate in magazine reading areas. 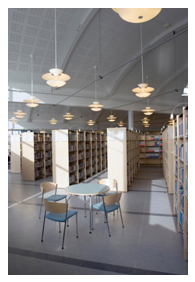 Reading areas with a high ceiling should use indirect or combination direct/indirect fluorescent or metal halide fixtures to reduce glare and create a quiet, subdued atmosphere. If there are study carrels, then a combination of general and task lighting is best. The stack areas need adequate vertical illumination of 20 to 50 footcandles to read the spines of the books on the shelves. Place fluorescent fixtures parallel between the stacks. The circulation desk may need to be set off with accent downlighting, to distinguish it from other areas. Use task lighting to provide 50 foot-candles on the desk. Library card catalogs on computers need 20 to 50 footcandles of illumination. Choose fixtures with a VCP of at least 70 to reduce glare problems. Microfiche reading areas need only 5 to 10 footcandles, but task lighting of 20 to 30 footcandles is needed next to the reader for note taking. High-efficiency fluorescent lighting is the best opportunity in libraries since there are almost no specific decorum requirements. Compact fluorescents should be considered to replace all incandescent lighting including spots, lamps and façade applications. All T-12 fluorescent lamps with magnetic ballast should be replaced with T-8 fluorescent lamps with electronic ballast. There may be a slight loss in light levels in some areas as a result of the retrofits. Reflectors and additional fixtures should be considered where reduced levels fall below IES Standards. Conduct a lumen depreciation study, however, before adding additional lamps or reflectors since the lighting efficacy of T-8 lamps is better than T-12 lamps.